Nolan’s Batman Trilogy – The Best Comic Book Movies Ever? Our next few podcasts will cover the Christopher Nolan Batman trilogy. We start recording this coming Friday, and in preparation, I watched Batman Begins. As I made my notes for the upcoming podcast, I was (once again) impressed with Nolan’s ability to take a classic comic book character and turn that into a superior film. Here are three reasons why I believe Nolan’s effort stands out amongst the glut of comic book films available today. 1. Nolan sets out to make a Batman film, not a comic book movie. 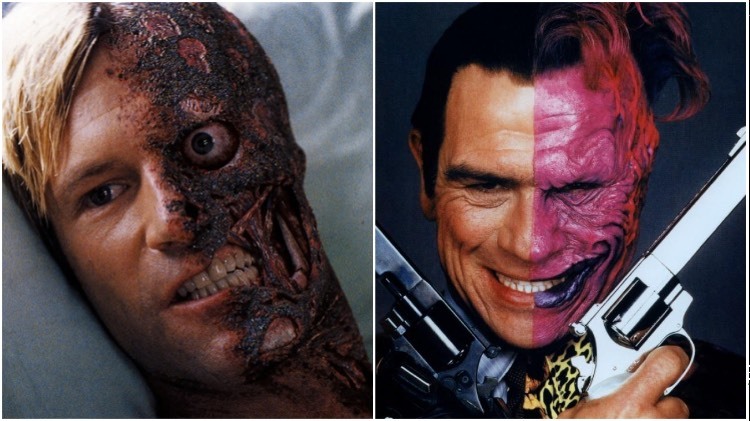 On the left, Nolan’s version appears horrific, but more realistic. Schumacher uses pink, purple, and red. Even from an emotional level, Nolan’s films have characters whose motivations make sense. They’re deep. They have complex worldviews. They are, in many regards, similar to you and me. At the end of the day, we can relate to Nolan’s characters, because we can understand them. The bottom line: If you changed the characters’ names and took away their costumes, Nolan’s films would still be great films. 2. Nolan’s Batman films have a singular focus. Upon re-watching Batman Begins for our upcoming podcast, I was struck by one over-arching theme prevalent in the film–a simple question: “What is justice?” The film explores other things (e.g., fear, dual identities, etc. ), but the clear and present theme is justice. Rachel has a view on justice. Thomas Wayne had a view on justice. Alfred has his opinion. Ra’s a Ghul has his take. Even Falcone and Scarecrow have a take (though theirs aren’t as blatant). Most comic book films mash together a wide array of characters, all with different worldviews. What Nolan does is artful. He pits heroes and villains against one another around the same theme. This allows for a singularity of focus. The movie doesn’t force its characters to prattle on about their worldview for no good reason. All the views and opinions expressed by the characters fall into alignment with the progression of the story. The protagonists and antagonists are at odds because they each have a different take on justice. And it’s their personal view of justice that drives them. The problem is that these disparate views on justice cannot exist in the same world. Conflict is the natural byproduct. The bottom line: Nolan’s focus on a single theme allows him to go deeper into that theme without getting lost down a rabbit trail. We must know: who’s take on justice will prevail? 3. The quality of Nolan’s Batman films is unmatched. The writing is superb. There are few needless lines of dialogue. The pacing is superior. The structure is outstanding. The actors are committed. The casting is phenomenal. The performances are real. The tone, cinematography, and action are well-choreographed. The costumes are subdued, but appropriate. And, except for a few scenes (e.g., the Tumbler chase on the rooftops), the film is believable. We can almost see this film playing out in downtown Los Angeles, New York, or Chicago. The bottom line: Nolan pulls elements from classic Batman comics, and he pulls the right ones. He pays homage without letting others’ opinions about the character overtake his own vision. My conclusion? Nolan’s Batman trilogy represents the best of what the genre has to offer. The Dark Knight, in my opinion, is one of the best films ever made. Batman Begins is phenomenal. The Dark Knight Rises is good, not great, but still well-deserving of praise in the greater context of the three films. But, perhaps more importantly than that, Nolan ushered in the new era of comic book films. Sure, the X-Men series laid some groundwork for Nolan to get his films made, but he brought the genre to the place it is today. We can only hope he chooses to do another comic book-based film in the future! Until then, we’ll re-watch his Batman trilogy. Be sure to check out our podcast series (subscribe via the links below) on the Batman trilogy, and please offer your thoughts on the topic! What’s your favorite comic book film, and why? Let us know!